Generic Lialda (Mesacol OD) is a locally-acting aminosalicylate used to treat adults (patients 18 years and older) with active, mild to moderate ulcerative colitis and for the maintenance of remission of ulcerative colitis. Mesacol OD prolonged release tablets are manufactured by Sun Pharmaceutical Industries Ltd. in the strengths of 1200 mg. We also have in stock Generic Asacol (Mesacol) which is also used to treat the same indications. 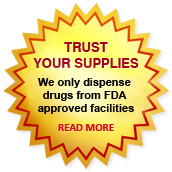 We supply original Mesacol OD prolonged release tablets manufactured by Sun Pharmaceutical Industries Ltd.. The active ingredient present in Mesacol OD prolonged release tablets is Mesalamine. Each tablet of Mesacol OD contains 1200 mg of Mesalamine. Mesalamine Prolonged Release tablets are used to treat ulcerative colitis, proctitis, and proctosigmoiditis. It affects a substance in the body that causes inflammation, tissue damage, and diarrhea. Generic Lialda is also used to prevent the symptoms of ulcerative colitis from recurring. The recommended dosage of Mesacol OD for the induction of remission in adult patients with active, mild to moderate ulcerative colitis is two to four 1.2 g Mesacol OD tablets to be taken once daily with meal for a total daily dose of 2.4 g or 4.8 g.
Take Mesalamine prolonged release tablets exactly as prescribed by your doctor. Do not take in larger or smaller amounts or for longer than recommended. Take Generic Lialda (Mesacol-OD) with a full glass of water. This medicine can usually be taken with or without food. Follow your doctor's instructions. Do not crush, break, or chew the tablet. Swallow the tablet whole. The extended-release tablet is specially formulated to release the medicine after it has passed through your stomach into your intestines. Call your doctor if you find undissolved tablets in your stool. Take a missed dose as soon as you remember. Skip the missed dose if it is almost time for your next scheduled dose. Do not take extra medicine to make up for the missed dose. Mesacol OD tablets are contraindicated in patients with known hypersensitivity to the active ingredient Mesalamine, salicylates or aminosalicylates or to any of the ingredients present in Generic Lialda (Mesacol-OD tablets). Mesalamine induced cardiac hypersensitivity reactions (myocarditis and pericarditis) have been reported with Generic Lialda as well as other Mesalamine containing medicines. The most common side effects of Mesacol OD (Mesalamine Prolonged Release Tablets) occurring in at least 3% of adult patients taking Generic Lialda were headache, diarrhea, upper abdominal (stomach) pain, nausea, nasopharyngitis (inflammation of the nasal passages), flu and flu-like illness, and inflammation of the sinuses. Get emergency medical help if you have any of these signs of an allergic reaction to this medicine ; hives; difficulty breathing; swelling of your face, lips, tongue, or throat. Stop taking Mesalamine Prolonged Release tablets and call your doctor at once if you have a serious side effect such as severe stomach pain, cramping, fever, headache, and bloody diarrhea. Overdose symptoms may include ringing in your ears, dizziness, headache, confusion, drowsiness, sweating, shortness of breath, vomiting, and diarrhea. You should not use Generic Lialda (Mesacol-OD tablets) if you are allergic to Mesalamine or to aspirin or other salicylates such as Disalcid®, Doan's Pills®, Dolobid®, Salflex®, and Tricosal®. Follow your doctor's instructions about any restrictions on food, beverages, or activity while you are using this medicine. Mesalamine prolonged release tablets (Generic Lialda) have been classified by the US FDA as Pregnancy Category B. Reproduction studies with Mesalamine prolonged release tablets performed on animals have revealed no evidence of impaired fertility or harm to the fetus due to Mesalamine. There are, however, no sufficient and well-controlled studies in pregnant women. Because animal reproduction studies are not always predictive of human response, this medicine should be used during pregnancy only if clearly needed. Low concentrations of Mesalamine and higher concentrations of its N-acetyl metabolite have been found in human breast milk. It is not known whether this medicine could harm a nursing baby. Do not use Mesalamine prolonged release tablets without telling your doctor if you are breastfeeding a baby. You can buy Lialda Generic pills online from Clear Sky Pharmacy at a cheap price. Mesacol OD 1200 mg prolonged release tablets, manufactured by Sun Pharmaceutical Industries Ltd., India are supplied in a blister strip of 15 tablets. The 1200 mg extended release tablets cost $0.90 only per unit when you place an order for 900 tablets.